The advent of Facebook’s new profile page design, dubbed ‘Timeline’, has spawned new opportunities for both enterprises and consumers to brand themselves creatively. Many users have already customised their profiles with striking combinations of profile and cover pictures, and now brands are starting to get in on the act. Fujifilm claims to be the first brand to have launched a Timeline campaign in Australia with their ‘Instax Yourself‘ initiative created by digital agency Reborn to promote their Instax Mini 7 camera. The campaign utilises an app that allows users to create personalised cover images from a series of themes that incorporate images from your album of profile pictures. The ‘Instax Yourself’ campaign follows what appears to be the world’s first Timeline campaign from Israel’s Anti-Drug Authority that makes use of the split down the middle of Timeline to contrast a life on drugs against a life without. 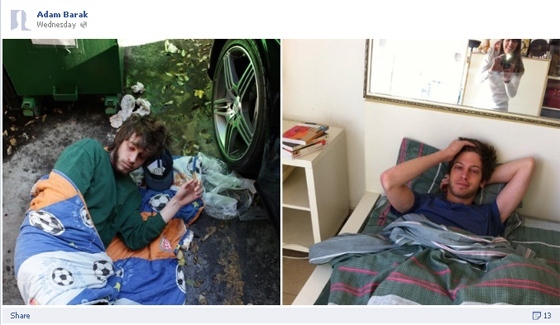 The campaign shows a year in the life of a fictional character on drugs compared to a year clean with side by side pictures of how relationships, home and work lives would play out in each scenario. 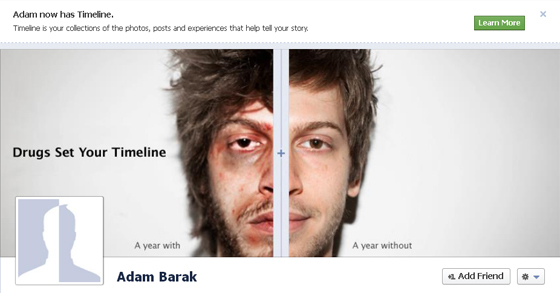 According to adweek, the campaign was created by agency McCann Digital Israel. Facebook’s Timeline isn’t open to brands yet, but the flurry of activity to use Timeline creatively bodes well for an update to its Pages product. With Timeline, Facebook has created branding opportunities for consumers as well as brands with a heightened visual aspect. It’s bringing personal branding to the fore for consumers, accelerating the trend of people intentionally branding themselves online in personal circles as well as professional.